The information presented on this website reflect the views, opinions, and techniques of The Armed Lutheran and it's contributors, but not necessarily our advertisers or sponsors. 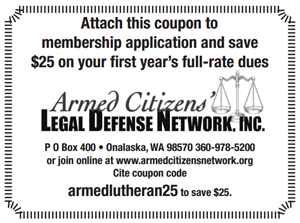 The Armed Lutheran advises visitors to this site to always receive professional training prior to arming themselves for, or engaging in, concealed carry, open carry, or self-defense. All products reviewed on this site were purchased, borrowed, or obtained by the Armed Lutheran and no compensation has been provided (or will be accepted) for any reviews. In all instances, The Armed Lutheran, our contributors and advertisers, expressly disclaim any liability that may result from the use or misuse of any information presented on this website. I do not seek, nor will I accept, compensation from the companies whose products I review. Unless otherwise noted, all products reviewed on this site are purchased by me and put to use specifically for the purposes of reviewing them. Companies who wish to provide testing and evaluation (T&E) products for me to review are welcome to do so, but I will not accept compensation of any kind in exchange for favorable reviews of your products. As a matter of full disclosure, understand that I have received compensation from one company, Cook's Holsters, whose products I previously reviewed on this site. I began using their products personally back in 2012 (and continue to use them), long before they became an advertiser. If you send me a product, I will write or record a fair review based on my personal experiences. If I don't like it, I will say so. If I recommend a product, I have most likely purchased it myself, I used it extensively, and I may continue to use it on a regular basis. If it's not a product I can wholeheartedly recommend, don't expect me to accept payment in exchange for B.S.